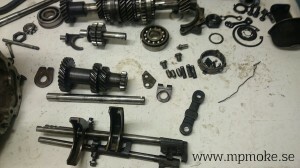 Comparing same parts but for different types of the gearbox. This entry was posted in Quick update on January 31, 2015 by admin. I got a message from my parts supplier. They were out of stock on some seals so they couldn’t ship. On Friday they got the seals, packed it all and shipped it. Will take some days, so theres a risk that next course night on Monday evenibg will he another one without parts to mount. I guess that we then will dig in to one of the remote “things” , the part that transfer the movement from the gear stick to the gearbox. And drink coffee of course! This entry was posted in Quick update, Technical and tagged classic, gearbox, Mini on January 31, 2015 by admin. 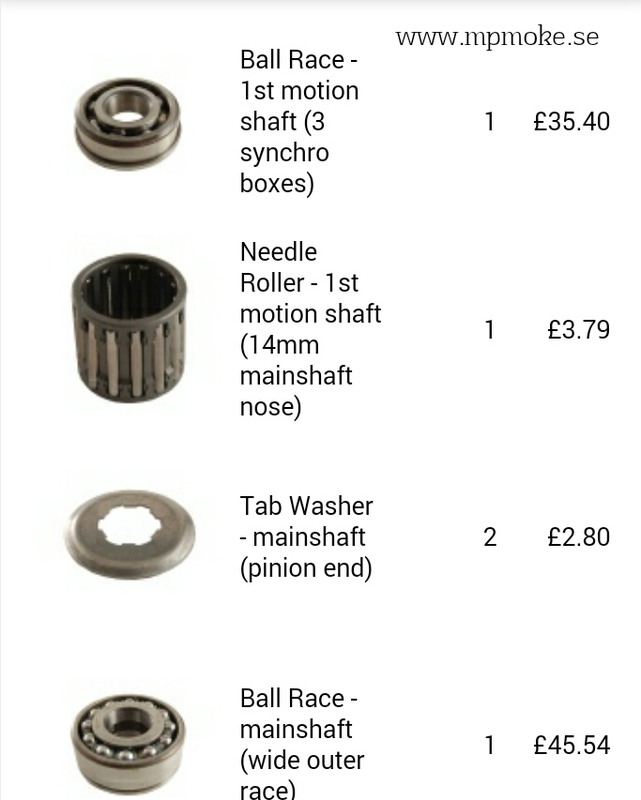 Wonder when parts will arrive? 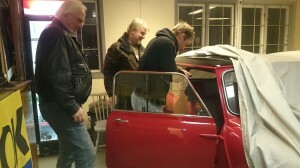 Wednesday evening we have the next meeting in the series of course nights of renovating a gearbox to a Mini. 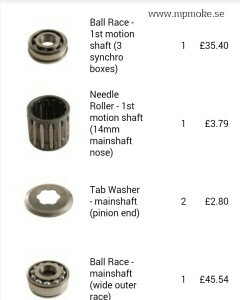 I have ordered some parts and just wonder if they will arrive in time? Otherwise we will have to dismount another gearbox, clean all parts or just drink a lot of coffee and tell stories! This entry was posted in Events, Quick update and tagged classic mini, gearbox on January 28, 2015 by admin. Yellow Moke, heap of rust.. I thought it was ready for mounting the rear subframe but I found a small hole, that grew. 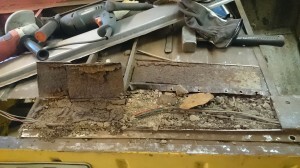 Here I now stand with the crossmember cut away and some big holes in the rear load bay area floor. 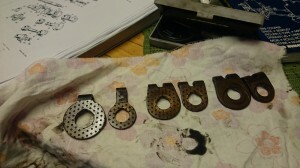 Hmm, sheet netal, scissors and a netal brake would helt to form new parts and then its time to start the welder. I’ll be back with reports. This entry was posted in body work, Technical on January 25, 2015 by admin. Something to get up the activity level in the Mini garage, a course of how to renovate a Mini gearbox, has started in Uppsala. 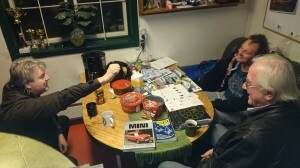 We are a some local Miniacs that meet every week to drink coffee, discuss and work on a Mini gearbox. Maybe there will be some more gearboxes to restore so everyone showing up can get more than knowledge out if it. The experience is mixed, someone has restored gearboxes before and others are total novices. 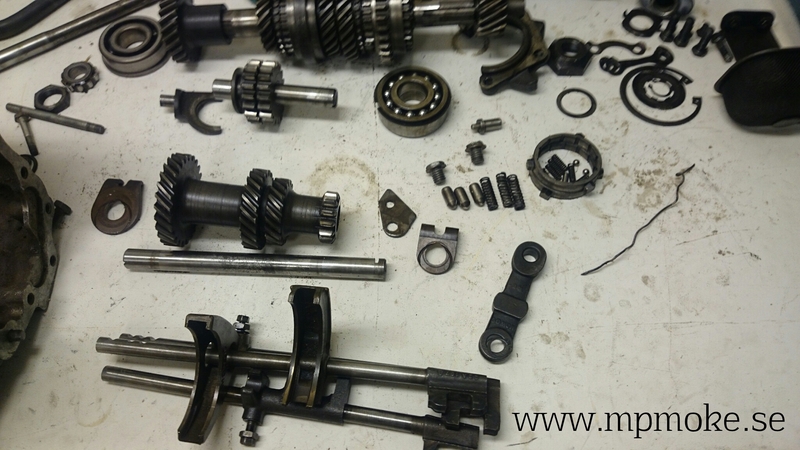 The idea is to find out how the gearbox works, how to take it apart, how to say if its worn or not, tell what parts to change, make an order list, order, sn then reassemble the gearbox with an eye on the details and with precision. I will be back with reports. This entry was posted in Technical and tagged 997, Austin, Cooper, gearbox, Mini on January 24, 2015 by admin.